With its polished and user-friendly hosting platform, GoDaddy is a web host that’s accessible to anyone. It’s a great option if you’d like to host your own blog or if you simply want an easy introduction into reseller or developer-managed hosting. For better or worse, GoDaddy is one of the most recognizable names in hosting with a wide variety of hosting products that offers something for everyone. GoDaddy, one of the world’s largest domain registrars and hosting services, has been around since 1997. Although its early start in the hosting game plays a role in its success, at least part of the reason is that GoDaddy’s marketing is relentless. Much of GoDaddy’s fame (or infamy?) comes from a handful of controversial ads that have drawn the scorn of certain interest groups as much as they’ve promoted the company. However, the campaigns seem to have worked nonetheless, making GoDaddy a household name that almost anyone around the world will recognize. You might have a few other concerns when looking at GoDaddy purely based on its reputation. Firstly, it’s no secret that GoDaddy has made use of questionable selling strategies. Its not-so-stellar reputation for upsells and misleading payment terms are still a significant concern for potential customers. I’ll address this issue through my own experience as a GoDaddy customer. Secondly, it’s not always a good thing when a company offers such a broad range of products and services. Having its attention split between multiple products can mean a lack of focus. Plus, with such a huge customer base, it might mean a drop in quality in its standards of service and support. At least part of my motivation for this review was to check out whether this is the case. GoDaddy provides a handy set of add-on features that will help you run an optimized and secured website no matter your skill level. On the whole, GoDaddy offers an excellent feature set. All the essentials are there, such as SSL certificates, domain registration, and WHOIS privacy as well as performance-enhancing CDNs and security tools. The only catch is that many of these are reserved for the more expensive plans or have to be purchased separately. 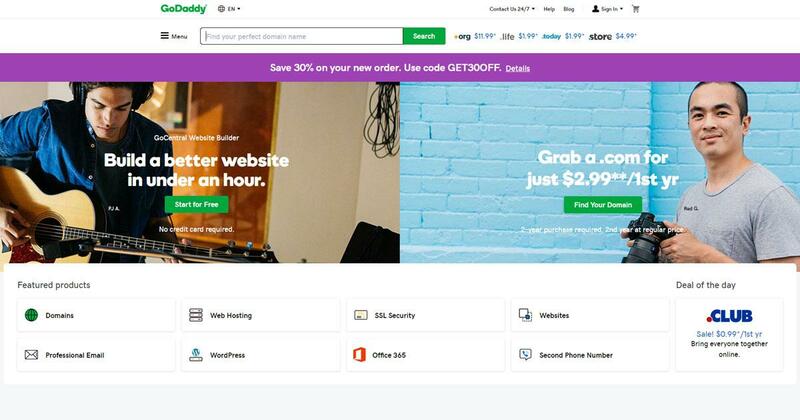 GoDaddy also offers its own website builder with its hosting plans, though once again, this is a paid subscription. GoDaddy’s Business Hosting plans combine the performance and secure infrastructure of a VPS with an intuitive and beginner-friendly dashboard, resulting in something similar to a managed hosting experience. This is a super option if you have a growing online business but don’t necessarily have the time or money to invest in a dedicated IT team. You’ll have full control over your website and CMS without the technical headaches of administrating your server. When you’re creating your WordPress website, GoDaddy will provide you with over a thousand free templates. Although these aren’t on the same level as the very best premium templates out there in terms of aesthetics and functionality, they’re better than most free WordPress templates. You’ll also have a few handy pre-installed plugins to get you started, such as WP101 Video Tutorials, Ninja Forms, Contact Widgets, the drag-and-drop Beaver Builder, and GoDaddy Email Marketing. If you’ve got at least the Deluxe WordPress hosting plan, then you’ll have access to this feature. It’s great for minimizing downtime while revamping your designs or implementing a new feature on your website. Your website will continue to be live while you work on a copy. Once you’re done, you can instantly replace the live website with the updated version. GoDaddy automatically backs up all websites daily and retains these copies for 30 days. When restoring backups, you’ll have a choice between restoring the files and your databases or just one of them at a time. The backup and restore tool is displayed front and center on your website management dashboard and is very simple to use. GoDaddy offers its own suite of website security and performance tools, which makes use of technologies such as Norton, Sucuri, and Spamhaus. You can add the security packages separately upon checkout. Features include a WAF (Web Application Firewall), malware scanning and removal, automatic resolution of Google blacklisting issues, a CDN, and advanced DDoS attack mitigation. 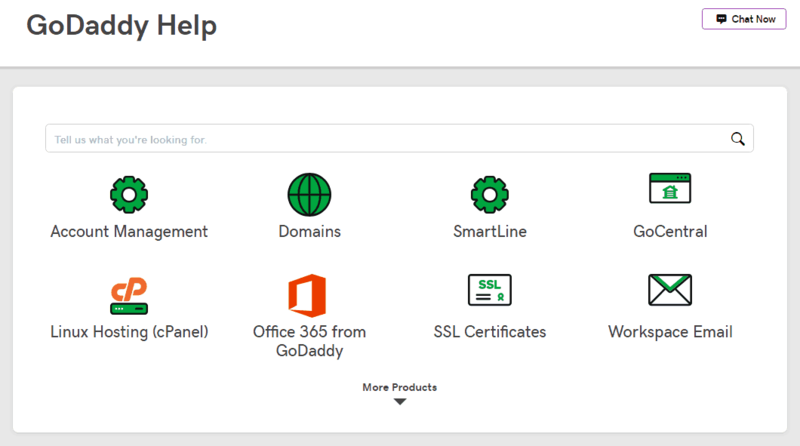 GoDaddy Pro is a suite of tools that makes it easy for developers or resellers to manage multiple websites from a single dashboard. You can update your core plugins and features for all websites from one place, set automatic backups, clone your websites, perform migrations, and even get real-time visitor analytics for all your websites. Pro Clients allows you to manage websites or online stores on behalf of your clients, even by making purchases on their behalf. Pro Rewards is GoDaddy’s referral and rewards program, through which you can buy upgrades or pay for your website with reward points. GoDaddy makes tools with complex and powerful features easy enough for beginners to implement on their website. Since the very beginning, GoDaddy has been at the forefront of making the web more accessible. Whether it’s domain registration or hosting, GoDaddy’s aim is to make it possible for anyone to have a presence online. As such, you can expect an experience that’s very user-friendly, even for beginners. GoDaddy’s uncluttered interface makes for a straightforward and intuitive hosting environment, particularly with WordPress hosting. As soon as you’ve purchased your hosting package, it’s easy to install WordPress. GoDaddy will take you step-by-step through the process with a simple setup wizard that will help you change the most essential settings for your website. GoDaddy provides one of the simplest and easiest-to-use dashboards I’ve seen. The interface is free of clutter and unnecessary options to confuse or overwhelm users new to hosting. Everyday tasks like restoring backups, changing or adding domains, and accessing your WordPress website are made very accessible and prominent. 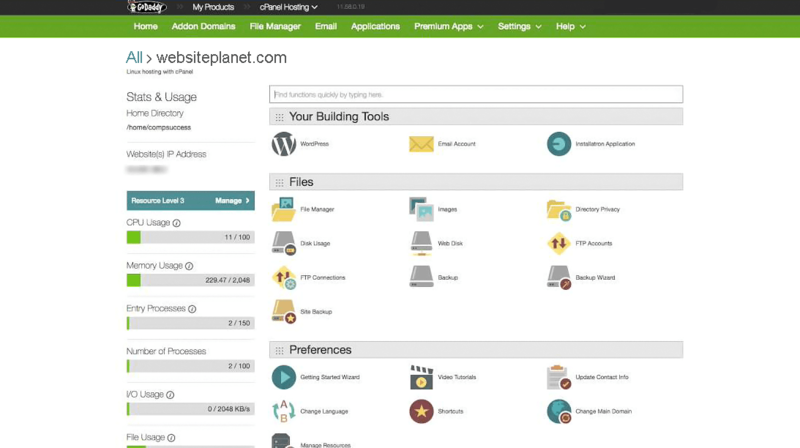 Non-WordPress-specific shared hosting comes with the cPanel control panel, which is widely regarded as the best hosting manager in the industry. More experienced users will likely prefer this option, as it provides much more control than their managed WordPress hosting. Another super-convenient feature is GoDaddy’s automatic website migration tool. Now, you don’t even need to contact support to move your website over. Just follow the prompt from within your dashboard and provide GoDaddy with your existing WordPress website link. GoDaddy will send you an email once the team is done migrating your website. Signing up with GoDaddy was very quick and easy, and it should take you no more than five minutes. If you’re concerned about GoDaddy’s questionable selling tactics, the only one I could spot was that it automatically selects the longest billing term of 36 months. However, the rest of the process was exceptionally transparent, and you can clearly see your renewal rates under each charge on your bill. 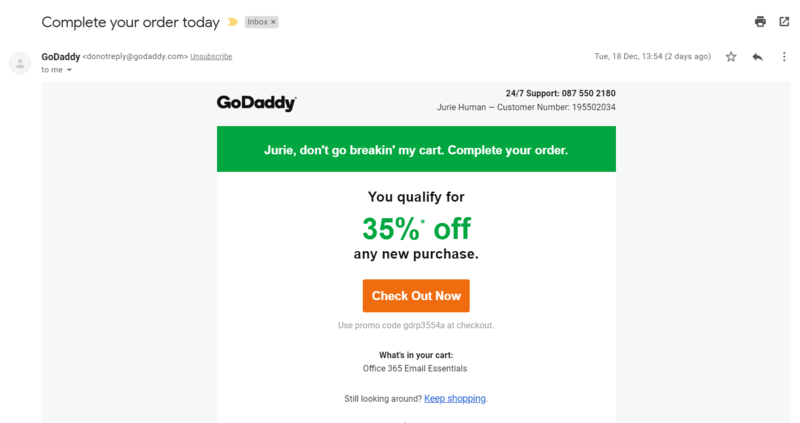 GoDaddy also keeps emails to a minimum, and although there are a fair number of upsells, at least it doesn’t employ blatant trickery such as auto-selecting these upsells by default. You can see what I mean in my full step-by-step guide on how to create a GoDaddy account. GoDaddy has done an excellent job of streamlining just about every process when it comes to hosting your website. Actions like purchasing an add-on and activating it are fast and simple. 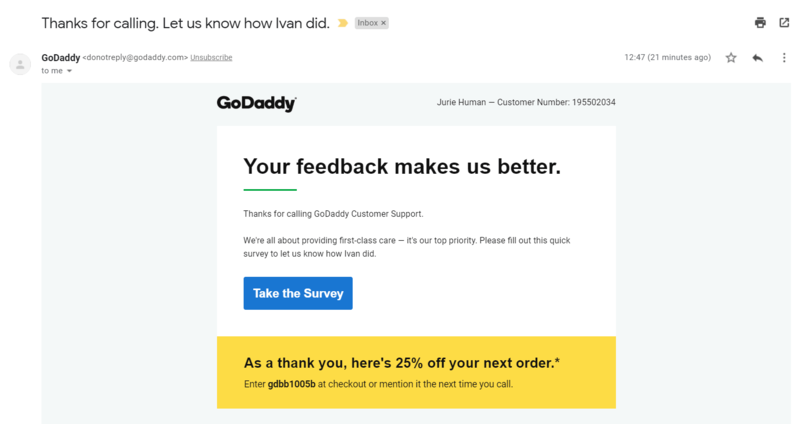 GoDaddy does most of the work for you in the background, especially when it comes to connecting your domain and adding the Website Security suite. The whole process of setting up my account to installing WordPress and adding a CDN took about 30 minutes. However, simply purchasing hosting and installing WordPress can be done in less than 15. Check out just how quick and easy it is in my complete step-by-step guide. Although GoDaddy doesn’t offer exceptional uptime guarantees, it still delivers top-drawer performance. If there’s one thing that GoDaddy is known for, it’s performance. It offers a 99.9% uptime guarantee for nearly all hosting products — not the most impressive guarantee I’ve seen, but it might just be GoDaddy protecting itself as the actual performance results seem to be much better. Depending on which performance testing tool you prefer, GoDaddy consistently performs within the top 20% for uptime and top 10% for speed. For the past 12 months, it has consistently maintained above 99.9% uptime for most months. However, there does seem to be the occasional blip during which uptime can dip below 99.9%. From a user perspective, there don’t seem to be any performance issues to complain about either. So far, working with my WordPress website, I’ve only experienced fast loading times with whatever I do, whether it’s installing themes or creating content. Nonetheless, I ran a Sucuri performance test to get an unbiased opinion. GoDaddy passed this test with a grade A+ performance score, as you can see below. The average load time for the U.S. was about 369.2 ms. However, there were a few exceptions, like Dallas and Los Angeles, that both had high loading times above 600 ms. It’s quite strange to have such a big discrepancy in the U.S., with San Francisco and Atlanta scoring very fast times of under 200 ms. India had a slow loading time of 1347 ms, which is pretty standard for that country. Overall, GoDaddy’s global speeds are better than most, but not fast enough to make it one of the top five hosts. It seems that as GoDaddy has grown, the company has had to replace some of its more technically knowledgeable staff with general support representatives. This means you might not always get an immediate answer to a technical query. Also, because of its popularity, GoDaddy’s response times can be very erratic. However, you do get two immediate support channels: live chat and phone, with dedicated lines for dozens of countries. Both are supposed to be available 24/7, but unfortunately, GoDaddy’s live chat isn’t always online. Sadly, GoDaddy’s help center also isn’t the best, as finding the relevant information can be a challenge. GoDaddy also doesn’t provide any email support, which is strange. As you can see from my interactions below, support agents aren’t always immediately sure how to proceed, which calls their training into question. This is often the case with outsourced support. What’s worth a special mention is GoDaddy’s WP Premium Support service, made especially for its managed WordPress hosting customers. This service is offered via a tiered structure using a credit system – the higher the tiered plan you purchase, the more credits you get. Credits can be used to call on the help of a support agent for managerial or administrative tasks. The services you get in exchange for credits include theme management, plugin management, config file changes, database management, evaluating your website for SEO-friendliness, or other essential WordPress tasks. As you can see, I was number 77 in line to receive support and my estimated waiting time was about 51 minutes. In the end, it took me even longer to actually get through to an agent. I wanted to know whether GoDaddy offered a CDN or whether it had to be purchased through a third party. The support agent had to take a moment to verify his information, but later informed me that GoDaddy does offer it as part of its website security bundle. As I’ve mentioned, GoDaddy’s terms and refund policies can be confusing to navigate. So, I called the support hotline to clarify some of the terms, as I figured it’d be easier to communicate over the phone rather than via live chat. Just like with live chat, the time it takes you to get through can vary depending on how busy GoDaddy’s support center is. However, I usually got through pretty quickly, and on this occasion, an agent answered the phone within ten seconds of me finishing the prompts. Make sure that you have both your customer ID and support PIN ready as this will speed up the time it takes to get in touch with an agent and make the process smoother. I was put through to Dimitri. I found that phone support was much like the live chat experience. Dimitri was courteous when he needed to be and provided me with the information I needed. This wasn’t a particularly technical issue, so any general support representative could’ve fielded that question. However, note that if you need to ask very technical questions or something regarding policies, you may be put on hold for anywhere between five to ten minutes while the agent looks up the information, which isn’t ideal. GoDaddy’s pricing is affordable, but although they’ve provided some transparency regarding their renewal rates, there are still a few tricky clauses. With WordPress and shared hosting as well as VPS and dedicated servers, GoDaddy provides a range of hosting products with a wide spectrum of prices. One thing it’s pretty good at is providing a variety of billing cycles for all hosting packages, ranging from monthly to triennial billing. Longer terms are also always discounted. Almost all plans come with unmetered bandwidth, although storage limits (and other resource limits for VPS and dedicated servers) can be a bit low for the price you’re paying. For example, with Superb Internet’s entry-level GridLITE plan you get 20GB storage at a lower rate than GoDaddy’s Basic WordPress plan with 10GB storage. All plans also come with a free domain for the first year, provided you’ve purchased an annual contract at minimum. When it comes to WordPress hosting, only the more expensive plans come with a free one-year SSL certificate. However, all Business hosting, VPS, and dedicated server plans come with an SSL certificate. If there’s one thing that GoDaddy is often criticized for, it’s that there are many upsells and you usually have to purchase extra services depending on your plan. For example, if you get a cheaper plan, you’ll probably also have to purchase SSL certificates, website security, backups, email, domain privacy, and so on. GoDaddy’s renewal fees can also be quite high for features such as a Microsoft 365 Outlook Mailbox, a domain (with privacy), or SSL certificates. Before you buy a product from GoDaddy, you should carefully read its refund policy. Monthly plans (i.e., all plans shorter than a year) only qualify for a refund within 48 hours of purchase. However, annually billed plans have a much more standard 30-day money back guarantee. The same goes for many of GoDaddy’s other products, such as SEO or social media management services. Another common clause to be aware of is that you will often no longer qualify for a refund if certain conditions are violated. For example, you will lose your Website Security refund if you manually removed malware from your website. The refund process itself is not the most convenient, as you have to make a call to a support representative. It also took some time, as they first need to check their policies, which further made me worry about their training. Although GoDaddy warns it could take up to ten days to process a refund, mine was completed within two days. You can read all about my experience cancelling and getting a refund in this detailed guide. Despite a few kinks in its support and pricing, GoDaddy does provide an easy,painless website hosting experience. GoDaddy is first and foremost a hosting provider that caters to those new to the hosting scene or who want a very simple hosting experience. That said, it does provide a few advanced features that will accommodate customers with more complex requirements. All of GoDaddy’s services and features are easy to purchase and set up; everything is accessible via an intuitive and clutter-free interface. It’s not all good news, though. One of the most frequent complaints about GoDaddy is that it has tricky refund policies and that the platform has a lot of upsells. This means that you might end up paying extra for the convenience the platform offers. So, whether GoDaddy is the right host for you or not, you’ll have to carefully read over the fine print — especially in terms of what you’ll end up paying long-term. If you do eventually decide to go with GoDaddy, then it’s definitely a very user-friendly and polished service. Wondering how GoDaddy Hosting stacks up against other Web Hosting companies? Enter any other Web Hosting company and we will give you a side-by-side comparison.